Now in its 18th year, World Milk Day is celebrated on June 1 in more than 80 countries with hundreds of events honoring this wholesome, nutritious beverage. From 5K races to festivals, World Milk Day festivities celebrate the dairy industry’s important contributions to sustainability, economic development and nutrition. And, personally, our celebration starts right at home. Hiland Dairy Milk is a must for my kids. They pour it over their cereal at breakfast, grab a carton of milk at lunch, and it’s the only beverage I serve at dinner. I know the nutritional value of milk and how important it is for my kiddos’ growing bodies. 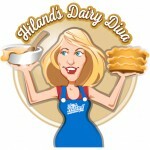 I also know that by purchasing Hiland Dairy Milk, I’m supporting local dairy farmers who help sustain our local economy. Everyone wins! Share your love of Hiland Dairy Milk by raising a glass for World Milk Day. Cheers!